We use the best, proven techniques to help you build muscle . Unlike other gyms, we don’t give you outdated or random training programmes that lead to uncertain results. We advise you on personalized, holistic nutrition plans for maximum muscle building. No fad diets or dangerous, unproven supplements are ever used. Our methods and entire team are guaranteed 100% steroid free. We teach you natural methods that work for building muscle. We don’t use programmes or coaches that use steroids and project a false impression of what is naturally possible. Programmes are tailored to your goals, experience and schedule. Unlike other gyms or fitness classes, we don’t give you generic programmes that are inefficient at building muscle. Only customized, effective training methods are taught. Busy schedule? Nagging injuries? No problem. We customize muscle building programmes to suit your schedule and health history. aggravate old injuries or health conditions. We teach, guide and empower you with skills to build muscle and keep results for life. Most gyms and trainers want to keep you dependent on them so you sign up for more training packages. Genesis Gym’s equipment setup means you almost never have to wait for equipment to be available. Most gyms or training studios make you wait, or change your workout to a less effective one that fits the available equipment. No chit-chat, playing handphone games, or making crude jokes. Genesis Gym is a healthcare facility not a nightclub. If you are serious about building muscle once and for all, Genesis Gym’s personal training program is the perfect fit for you. Clients are often shocked when they learn about the unrealistic standards of the fitness and personal training industry. It contains a tremendous amount of false and misleading advertising. Most fitness ‘celebrities’ are on anabolic steroids and injected hormones. But these can have serious long-term health consequences. At Genesis Gym, we use natural and safe methods to build muscle in a healthy way. No one on our coaching team has ever used steroids, and we will keep it that way. Many programmes only work for the genetically elite, not the average person. With Genesis Gym’s personal training, your customized programme is designed to work specifically for you. You’ll never again be fooled by unethical advertising, fad diets or unscientific workout plans. Many body builders have huge muscles but poor overall health. At Genesis Gym, you’ll improve your health markers like blood pressure, liver function, body acidity and sleep quality even as you build muscle. Kenneth is a busy executive who had been training at a regular commercial gym with a trainer but had struggled to build muscle and burn fat. He decided to join the personal trainers at Genesis Gym and within 12 weeks he dropped 9kg of fat and gained 4kg of muscle. This was despite a heavy work schedule and a previous knee injury that made him worry about training hard. With the customised programme at Genesis, the injury did not hinder his progress at all. Kai Jie is a full-time corporate executive who tried to build muscle for several months without much success. In Genesis Gym’s personal training package, we provided him with a personalised nutrition and training programme while helping him change his lifestyle habits. This combination resulted in a lean mass gain of 6 kg and fat loss of 7kg within his first 12 weeks of training. Lack of overall health is a big reason why many people fail to reach their muscle-building goals. If you want to build a strong muscular physique naturally, you will need to be as healthy as possible. The Genesis team will help you with your nutrition, digestion, detoxification processes and stress levels. When all these systems are in balance and your health is optimal, you will be able to put on muscle successfully. Many fitness magazine models and bodybuilders work out 23 hours a day, 6 days a week. We can assure you that most people on those kinds of programmes are also using steroids. We know that most of our clients don’t have that much free time to spend in the gym. They are busy people with many family, work and social responsibilities. They also want to do things naturally. Genesis Gym’s personal trainers take your schedule and recovery into account. We will help you achieve results without spending all day in the gym. So many programmes out there promise wonderful muscle growth and strength gains. But for each success, there are many failures. Why? Because no programme is perfect for everybody. 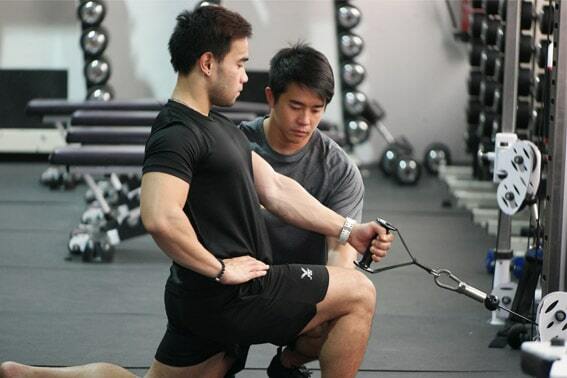 At Genesis Gym Singapore, your programme will be customised for you. Your body type, stress levels, training experience, schedule, hormone profile and medical history are just some of the factors that go into designing your personal training programme. We believe in open communication between you and our personal trainers. All aspects of your programme will be discussed with you and adapted to your needs. Of course we will help you understand the reasoning behind your customised programme. But we’ll also keep you abreast of the latest scientific research and techniques. This is just another way we help you achieve your muscle-building and health goals. We also know that hard training is needed to build muscle. Our team is here to cheer you on each time you train. With this kind of support, you’ll achieve more than you dreamed was possible. Eating healthy doesn’t have to be hard. In fact, eating the foods that build muscle should be enjoyable! Our nutrition plans, supplements and lifestyle advice will help you achieve your muscle-building goals. The Genesis Fitness System works for everyone, even if you’ve been underweight your whole life. We are so committed to your success that we even provide training programmes for days when you can’t come to Genesis. Instead, you can use your home or office gym. ‘I know exactly what it feels like to be fat and out of shape. All through my childhood and school days, I was called fei zai (“fatty” in Cantonese) and was in the “Trim and Fit” or TAF Club, which meant no recess and no food. Just running around the school track with no results. ‘One day I realised that enough was enough. I wanted to get fit, lean, healthy and strong once and for all. I tried everything out there and spent thousands of hours studying and applying just about everything I could get my hands on about fat loss, fitness and health. Umesh is an IT professional who took up personal training at Genesis Gym for the sole purpose of gaining muscle mass. He had tried other methods in the past without success. After just 10 weeks of training with us, he gained 8kg of hard muscle! Graham is a manager in the finance sector who had adopted the stereotypical late-night, hard-drinking lifestyle. He decided that enough was enough and signed up at Genesis Gym.